Runrio presents Run For Your Life 2 happening on March 1, 2015 (Sunday) at 4:00am at Ateneo de Manila University and University of the Philippines-Diliman in Quezon City. This run will support the scholars of Ateneo School of Medicine. Five (5) distances are available: 500M, 3K, 5K, 10K & 16K. 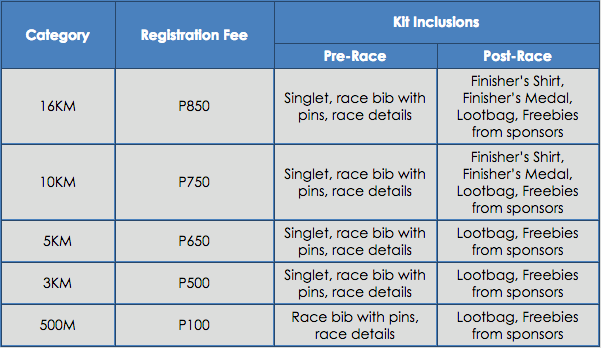 Registration is ongoing until February 23, 2015 for in-store and online. 1. Credit Card/Paypal. Register online via http://runrio.com/run-for-your-life-2. Ongoing until Feb 23.
c) TOBY'S (SM North & SM MOA) or RUNNR (BGC). Ongoing until Feb 23.